War is not the only time when fishermen can be actively threatened at sea. In the past, threats came from pirates. Although they were more likely to prey on of merchant ships with their rich cargoes, they might take hostages from fishing boats. However, fishermen did find themselves the target for the so-called Dutch "copers". These were ships that supplied crews with grog until their trade was banned by law in 1893. Being drunk on board was a recipe for disaster with all the complex equipment of a sailing vessel, and the fishing gear to control. The early boats offered no protection from the wet or the cold. Clothing was very basic. There were only natural fibres and no waterproof fabrics. The sheer weight of the fisherman's clothing was in itself a danger. 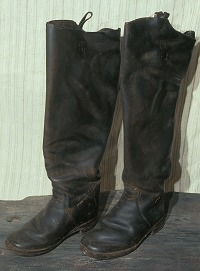 His long heavy boots were made of leather, which did not keep the water out. He wore woollen 'gansey' sweaters and serge trousers. These were thick and warm, but they did not keep out the wind or rain and quickly became waterlogged. If swept overboard, the heavy clothes, and particularly his boots, would drag him down. He stood little chance of survival. Now there are man-made fabrics, which are light, warm and waterproof. There are also lifejackets and other clothing that helps to make the fisherman safer at sea.